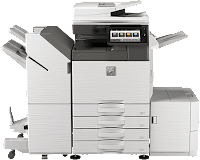 The Sharp MX-3051 Essentials Series color document systems are built using the latest technology available to deliver the performance, features and reliability needed in today’s busy workplace environments. These new MFPs are also easy to use and offer enhanced productivity, all to provide customers with a seamless, intuitive experience, and the confidence in knowing their jobs will come out right the first time, every time. The new Color Essentials Series also offers leading-edge security features to help businesses protect their data and personal information. The new MX-3051 Color Essentials Series document systems are feature-rich and offer businesses powerful multitasking features at a strong value. Browse to “Setup.exe” file and then run it.